What goods cannot be delivered from the USA to Estonia? The USA EshopWedrop Origin warehouse is based in New York. This means, that every time you are shopping online from online retailers your parcels will be sent to the USA Origin Warehouse, and from there your parcels will be delivered to the UK warehouse, via Heathrow airport, before delivered to you in Estonia. When parcels arrive at London Heathrow Airport, UK, each of them is subject to import customs formalities – this allows the parcels to be circulated as EU parcels to any EU destination country without any other customs formalities during the transit or at destination. Vegetables, bulbs, fruits, potatoes, dairy or other animal products – fish, eggs, honey, milk. Meat - including ham, bacon, sausages and pate. Perishable products of any kind. Any food, supplement, drug or cosmetic that has been issued a Consumer Safety Advisory Warning. Live or dead animals, bees and other insects, raw skins, raw furs. Wood, wooden charcoal, iron and steel, magnets. Money, Credit Cards, Debit Cards. Batteries, explosives, flammable substances or other dangerous substances/radioactive substances. Aerosols, gasoline, diesel and other fuels, lighters containing fuel. Tear gas, mace & pepper spray, gas masks & gas mask filters. Fireworks, gun powder, firearms, weapons, explosives, ammunition, military equipment, self-defence sprays, airbags. Illegal drugs, pharmaceutical products (including veterinary), pesticides, herbicides, fungicides. It’s our priority to ensure your parcels are customs cleared and delivered to you. However, for parcels containing products as per the list above, we cannot be held liable for your losses. The authorities are at the extreme of confiscating and destroying these items. We strongly suggest before placing an order, that you read our Terms and Conditions – 3.10 (3) regarding size, packaging and contents of the Parcel. What are the charges for delivery a parcel from USA? * Chargeable weight: The Chargeable Weight of Air Freight shiopmemnts are calculated as the Actual Weight (Gross Weight) or the Volumetric (also called Volume or Dimensional) Weight of the shipment, whichever is the greater. The Volumetric Weight that is calculated based on the dimensions (length, width and height) of a parcel: Length (cm) x Width (cm) x Height (cm) / 6,000. Typically, large items with a light overall weight take up more space on an aircraft than a small, heavy item. That’s why the Airlines charge according to Chargeable Weight. When parcels arrive at London Heathrow Airport, UK each of them are subject to import customs formalities – this allows the parcels to be circulated as EU parcels to any EU destination country without any other customs formalities during the transit or at destination. Low Value (LV) Parcels with value up to £14.99: Parcels to this value are exempt from custom formalities, import VAT or import duties. Medium Valu (MV) Parcels with value from £15 to £134.99: Individual parcels will be charged with Import VAT of 20% from the Statistical Value. High Value (HV) Parcels with value above £135: Individual parcels will be charged as per the Import VAT of 20%, plus Import Customs Duties depending on the products categories, all applied to the Statistical Value of each parcel. Statistical Value - The Import VAT and Import Duties are calculated based on Statistical Value which is the Declared Value slightly increased by the HMRC. From our experience so far but without this being a guaranteed factor, the average statistical factor was 1.04 (4% average increase of the Declared Value to obtain the Statistical Value). Import Customs Paymets are made of the Import VAT, Import Customs Duties and any other Import Taxes paid by EshopWedrop to HMRC (UK Customs Authorities) on behalf of the clients for importing the parcels into UK. They are paid in GBP and the same amounts without any margin on top are updated in the EshopWedrop system for each parcel. The system is then converting the GBP amounts into each destination country’s local currency (e.g. EUR for Lithuania, RON for Romania) based on the official exchange rates published by the local national bank and applicable in the day when the import customs formalities were done and the import payments were made by EshopWedrop on behalf of the clients. These Import Customs Payments will be calculated as amounts to be paid by the client at checkout when each such parcel is ordered by the client for final delivery in the destination country. Import Customs Clearance Service Fee: This is the service fee charged to the clients by EshopWedrop for the service for taking care of the import formalities of each parcel. These fees are different for LV, MV and HV parcels and are according to the official tariffs list published on the website. Import Customs Payments Service Fee: this is the service fee charged to the clients by EshopWedrop for the service of making the Import Customs Payments on behalf of the client. These are Import VAT, Import Customs Duties and Other Import Taxes paid by EshopWedrop (or its subcontractors and appointed agenst) to HRMC (UK Customs Authorities) in order to import each parcel. This fee is a percentage from the total amount of such Import Customs Payments made for each parcel, with a min amount being charged and they are according to the official tariffs list published on the website. IMPORTANT NOTE: Each parcel will be treated individually. This means the Import Customs procedures will be applied separately to each parcel. In case of more than one parcel for the same client consolidated into one shipment arriving in London Heathrow Airport, UK, the cumulated value of all parcels for the same client is considered for determining each parcels’ customs category (Low Value Parcel, Medium Value Parcel or High Value Parcel). E.g. regardless of individual values, two parcels each valued £10 will be considered as a Medium Value Parcels – this is as a result of their cumulated value of £20 and will be custom cleared in line with the Medium Value Parcels import customs payments and and services fees as presented above. Is there a max limit in the parcel’s chargeable weight? Is there a max limit in the parcel’s declared value? * If your parcel exceeds any of these limits and prior of ordering, please contact our team and one of our customer’s representatives will advice you of the process needs to be followed. Only parcels within these limits are considered Parcels as defined in our Standard Terms and Conditions and the tariffs and all the other conditions are apploicable. Any parcel exceeding any of these limits will need to be agreed with special conditions and tariffs applicable offline. Is the service available for companies or only for consumers (private individuals)? The service can be used also by companies but it is very important to understand that the import customs clearances are done in UK electronically and bulk for the entire shipment made of all the parcels consolidated into one transport. Therefore we cannot provide any Import Customs Declaration for each parcel which usually companies require as supporting documentation for the import VAT or import customs duties paid for the import formalities. The above is applicable for all the parcels even for those for consumers (private individual clients) – there will not be available any individual Import Customs Declaration for individual parcels and we will not be able to provide to the clients supporting documentation for the Import VAT or Import Customs Duties paid for individual parcels. How to Shop from the USA? 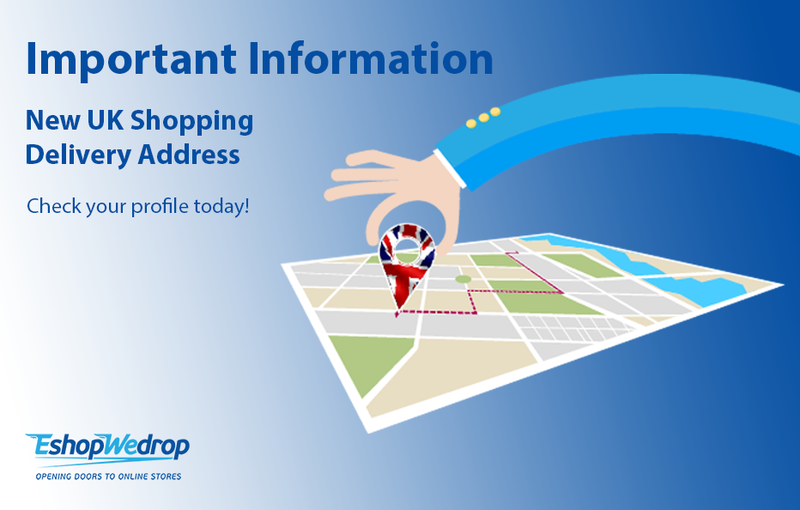 Are you trying to place an order using your EshopWedrop American Delivery Address? We strongly recommend that you review the information below - you need to follow the guidelines below to ensure your parcel is successfully delivered. How does the USA service work? The USA EshopWedrop Origin warehouse is based in New York and close to JFK airport. This means, that every time you are shopping online from online retailers your parcels will be sent to the USA Origin Warehouse and from here they will be delivered to the UK warehouse, via Heathrow airport. Deliveries to the USA Warehouse are accepted from Monday to Friday 9am to 5pm (New York time). All parcels are processed within 24hrs after delivery, except those delivered during Thursdays, which are processed on the same day. Cut off times – Parcels with customs details updated and confirmed by 9 AM Eastern Time (ET) for each departure day will be included in the same day’s departure. Currently we have one weekly departure from the USA Origin Warehouse, on each Friday with the airfreight departure from JFK Airport, NYC on Sunday and arrival at London Heathrow Airport on Monday morning. Thus parcels delivered to our USA Origin Warehouse from Friday to Thursday will be processed and recorded in our system by Thursday Close of Business (ET). The clients will need to update the customs details of these parcels by Friday 9 AM ET in order to ensure they will depart the same Friday. What do I need to do when parcel arrives at the USA warehouse? Upload supporting documentation for the products categories and values declared (invoice, online order confirmation, proforma invoice, etc.). This document must present clearly the description of the products, the quantity and the amount paid for the products. If any of these details are missing the parcel cannot depart from the USA! You must complete the product category details mentioned above in ENGLISH ONLY and must match the description from the supporting documentation (invoice or online order confirmation). Declared value in USD including any applicable sales tax and USA delivery charges, according to the supporting documentation uploaded. The maximum value per parcel accepted by the system is USD 2,500. This is the maximum value for simplified export formalities accepted by the US Customs Authorities. Please note: If you do not have a default delivery address in your destination country declared in your account you will be prompted to add one. This is a necessary condition for the parcels to be sent from the USA. This address will be declared as your address for the export and import customs formalities. What happens when the parcels arrive in the UK? Firstly, Parcels arrive in the UK on Monday at the Heathrow Airport for import customs clearance (see more details below about the import customs formalities). Once the parcels have been customs cleared they will be delivered by Tuesday (12 PM UK time) to the EshopWedrop UK origin warehouse. At the UK Origin Warehouse the parcels will be sorted and will leave on the next scheduled departure from UK to Estonia. For further questions please feel free to contact our Customer Service Team. How does the service work? Read our Step by Step Guide. STEP 4 – Wait for our confirmation that your order arrived at your EshopWedrop Personal Delivery Address (please consider the delivery time in the respective country according to the local delivery option you selected when you placed the online order). Once your order has arrived at the EshopWedrop warehouse, our team will it arrange for the parcel to be delivered to Estonia. Thousands of online shoppers in Europe use EshopWedrop to deliver their parcels when shopping online from abroad. Brands you love, delivered to you: With EshopWedrop you have access to high quality and cheaper products from the biggest online retailers in Europe. Even from those that don’t deliver to Estonia. EshopWedrop does! Access to product sales across Europe: We all know that there are huge sales running online in markets such as the UK. Most of these products will be more expensive or not available in Estonia! With EshopWedrop you can now shop for any products and enjoy the benefits of the discounts and sales in the UK, USA, French, Polish, German and Italian market. Consolidate your orders: It is likely that you want to buy products from multiply shops or even different countries, which can result in high delivery costs. With EshopWedrop, you can combine all your orders under one consolidated delivery and tracking number, so all your packages will be delivered together to you, saving you money and time when collecting them. Multiple Delivery & Collection Options: Online shopping means convenient shopping! What is the Personal EshopWedrop Delivery Address? Once signed up you will receive your Personal Delivery Addresses for your online shopping in the Poland, Germany, France, Italy, the UK and USA. You can find these addresses when you log in to your Personal EshopWedrop Account. These are the main EshopWedrop Warehouse Addresses. When you are shopping online and use one of these addresses, your parcels are being delivered to the relevant country’s EshopWedrop Warehouse. Via this process you can sometimes benefit from a free delivery option that online retailers often offer its customers. Meaning, you only have to pay for the costs associated for EshopWedrop to deliver your parcel to Estonia. Example: You have ordered a book from Amazon.co.uk that qualifies for free UK delivery and you have used your UK Personal EshopWedrop Delivery address at the checkout. This means that your parcel will first be sent to our UK EshopWedrop Warehouse allowing you to qualify for the Free delivery option that Amazon.co.uk sometimes offers. Your goods will then be delivered from the UK warehouse to Estonia and you will charged based on the delivery charge you have selected. What are the times and dates for delivering parcels to my shopping address in the UK, USA, Poland, Germany, Italy, France? What are the benefits of cross-border online shopping? You have more freedom of choice. EshopWedrop provides consumers in Estonia with the freedom to purchase products from online retailers in Poland, Germany, Italy, France, Lithuania and the UK, as well as USA. · Automate your deliveries. Do it once – enjoy regularly. · Combine your purchases automatically – get volume discounts. · Use our customer-friendly, competitive international delivery prices. · Gain access to hundreds of online stores. · Choose delivery or collect option that is best for you. The online shop (Ebay.co.uk, Amazon.co.uk) would not accept the telephone number provided by EshopWedrop. What should I do? 1. Chech you choose delivery country correctly. How do I know that my products were received at my EshopWedrop shopping address? - Link to your EshopWedrop account where you can see a picture with your parcel (parcels) as well as all the details above. Also, at any time you have the option to check your parcels in your EshopWedrop account. You will find here all the details and the status for all your parcels, consolidations, history and invoices raised to you. When do the parcels received at my personal online shopping addresses depart to Baltic Central Warehouse? How can I check my parcels and how can I find out when they arrive at destination? - the parcels are delivered to you. Also, you have anytime the option to check your parcels in your EshopWedrop account. You will find here all the details and the status for all your parcels, consolidations, history, invoices raised to you, etc. Can I consolidate more parcels in one order? Of course, this is one of the biggest benefits for using EshopWedrop. We will store your parcels in Destination Warehouse (DW) for 30 days, free of charge. This allows for your other parcels to arrive in the DW and then make one delivery order for all your parcels. We will charge you based on the cumulated weight and volume for all the parcels consolidated in one order, opposed to separate orders. Meaning you save on your delivery costs. Can I also buy from other European countries? Of course, you can order from any online shop from all over the world which is making deliveries to one of your EshopWedrop shopping addresses – USA, Poland, Germany, Italy, France and the UK. We will receive your parcels at any of the EshopWedrop shopping addresses and we will take care of everything so that your products will be delivered safely to Estonia. Where and when can I collect my parcels? You can complete the final delivery of your parcels as soon as they arrive in our destination warehouse in Vilnius. - Venipak pick up points. You will be notified via SMS and email when your order will arrive at the Venipak pick up point. You can pick up your parcel here per 5 working days. - Venipak courier can deliver parcels to door. - DPD delivery to door. You can find Venipak terminals and pick up points locations and working hours here. You can find DPD Click&Collect points here. You can find Omniva Click&Collect locations here. Can my parcels be picked up by another person? Your delivery charges and invoices will be displayed in your EshopWeDrop user account. You will also be able to see the status of your deliveries here. Can I buy from other online shops? Other than those detailed on the EshopWedrop website? Absolutely! Our online shops directory is only for guidance and ideas for you to explore. You can buy from any online shop which is making deliveries to one of your EshopWedrop shopping delivery addresses. I made an online purchase, but I cannot see it among my parcels in my EshopWedrop account. Why? What can I do? - We kindly ask you to check if the online store has sent your products and if they were successfully delivered to your EshopWedrop shopping address. - Did you receive a tracking number for the order from the online store? We recommend you use a track & trace delivery option, this sometimes costs (a little) more, but for peace of mind it is worth it. - If the products were delivered, but the retailer did not correctly label your unique shopping address on the parcel, we will keep your parcels in the "Unidentified" category and will make investigations. - We kindly ask you to contact us and send us all the details you have in order to clarify the situation. Can I compare prices between various online shops? Of course! We recomend you use Pricerunner for your shopping from UK, for example. Ceneo - in Poland. Kelkoo - in Italy. Preis - in Germany.